We have several different feedings in the Giant Ocean Tank. Some are broadcast feeds (meaning we scatter the food), some target our larger predators and some target the smaller shyer fishes. 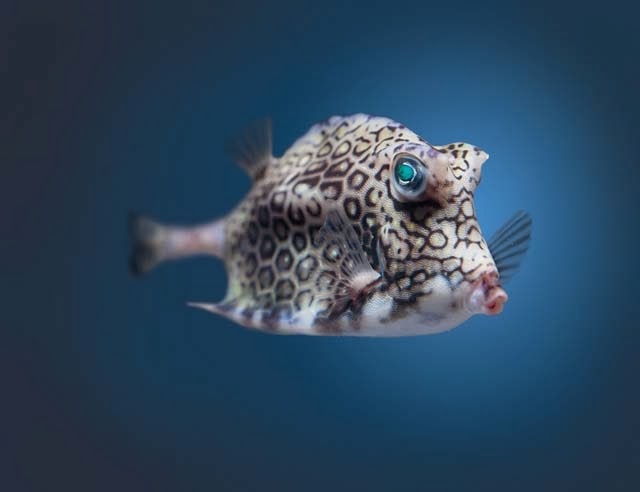 This squid tentacle feeding is specifically for the boxfishes: cowfishes and trunkfishes... and sometimes for smaller puffers that come looking for a handout. As you can see, it's not always that easy to only feed the boxfishes. Others come by, knowing they may be able to snag a morsel or two. The biggest culprit? The porkfish (yellow and black fish) are notorious tentacle thieves, and most divers feel accomplished if they can keep them from getting any (don't worry, they have ample opportunity to eat during other feedings). Our local followers might recognize this boxfish—a honeycomb cowfish, Acanthostracion polygonia. This fish appeared on some of our splashy advertising this summer announcing the reopening of the Giant Ocean Tank. Some of the divers call this the cuteness feeding. Because did you see all those little fish lined up for their snack in the video?! If you want to get a look for yourself, we're usually feeding these fishes around 11:15 each morning (though of course that could always change day-to-day, depending on the animals' needs). And stay tuned for more about the other feedings inside the Giant Ocean Tank.